It is a long train ride from London to Cardiff. Passing through some wonderful lush green countryside and across the wide Severn estuary and heading towards the craggy beauty of Wales, I enjoyed the brisk Autumn weather. 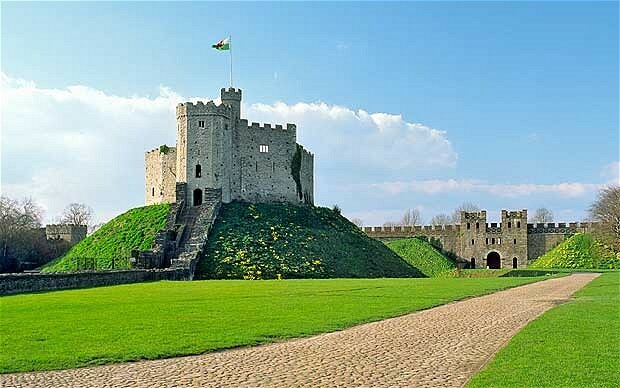 Cardiff is set nicely on the south coast of Wales and is home to an excellent castle, a magnificent national sports stadium and a well developed harbour housing and entertainment complex. While these highlights are known to be there, soon after arriving at the station in the centre of town you enter a pedestrianized area full of shops that could be in any UK high street. On a crisp November day I headed for the hotel, the chosen venue for a three hour evening session for MPDVoice to educate and enfranchise some more patients with Myeloproliferative conditions. And education is something we do all need. Remember How you felt when first diagnosed? The doctors try to explain and throw various terms at you that you don’t understand, partly because you are in shock and partly because the terms fly past and do not stick. So you go home and get on the internet and start looking stuff up and frighten yourself silly. Even with a partner you can feel quite alone. You get more chance to talk to the local medics but just how familiar are they with these rare conditions…. and are they just saying that to placate you and keep you stable? You need information from an informed medical source, often a second opinion from a disease specialist but sometimes contact with fellow sufferers enables you to learn and reinforce what you are learning. MPD Voice is a UK based charity whose goal is to provide clear and accurate information and emotional support to everyone who suffers from a myeloproliferative disorder. The information is provided in two ways. 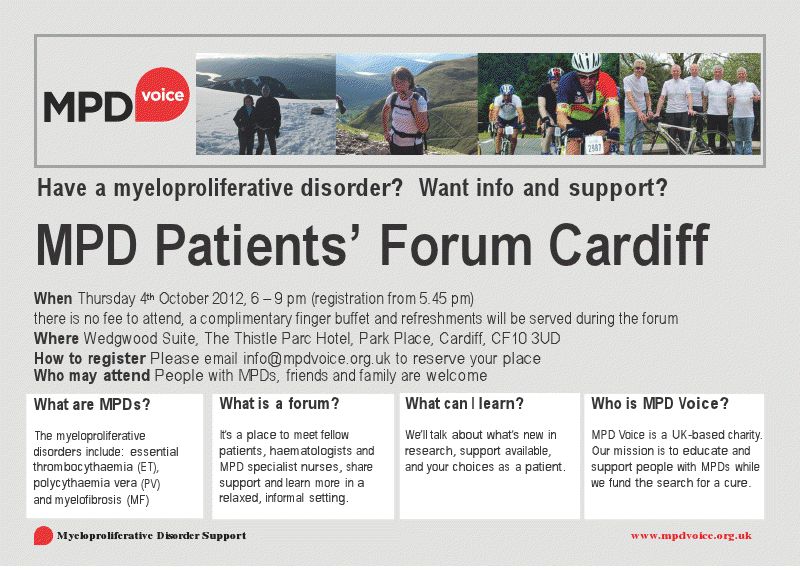 First an excellent web site www.mpdvoice.org.uk and then a series of patient forums in large cities around the UK and Ireland. 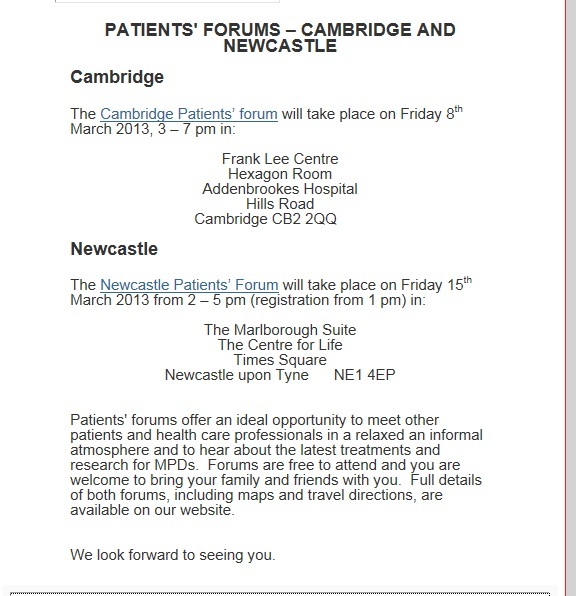 These patient forums – and that’s why I took that long train ride to Cardiff — educate patients with presentations by professionals, stories delivered by fellow patients and the opportunity to talk to people in the same position as you, in breakout groups split by type of MPN. Usually 70-100 people show up. A shorter but nevertheless taxing 70 mile car journey took Elizabeth Bassett to the Cardiff seminar and this is her summary. Although I had been diagnosed with Essential Thrombocythemia in 1999, I had never met anyone else with a myeloprolific neoplasm. So it was very easy to feel alone and a bit of an oddity with this relatively rare condition. However, on attending the MPD Voice Cardiff Seminar last October, this changed completely. On arrival I was greeted by Prof Claire Harrison and as I wrote my name on a label I recognised Chris Harper from the MPN Forum standing behind me. So suddenly I was no longer alone. The seminar consisted of several short talks including one by Dr. Stephen Knapper, University Hospital, Wales. Prof Claire Harrison detailed the latest research into drugs combating, in particular,r MF but with a wider ranging potential and she was upbeat about future treatment of all MPNs. For me of particular interest was hearing a fellow ET patient discuss his diagnosis and treatment with interferon, and I found it very beneficial to compare experiences with him after the main body of the seminar. However, the highlight was hearing Chris Harper detail his life-threatening diagnosis with MF and his amazing recovery through his SCT. We were treated to an excellent buffet after the talks, which gave ample opportunity to raise issues with the specialists present and they talked freely and willingly to us all. However, the long lasting benefit I believe was the opportunity to meet and share experiences with fellow MPNers. Post seminar you then know that you are not alone and that excellent, caring, top medical professionals are willing to travel to share with you.. While our diseases are rare, there are many who have them among the billions of people on the planet, it is simply a matter of hooking up. MPD Voice does this very successfully in the UK. © Chris Harper, Elizabeth Bassett and MPNforum.com, 2013. Unauthorized use and/or duplication of this material without express and written permission from this blog’s author and/or owner is strictly prohibited. Excerpts and links may be used, provided that full and clear credit is given to Chris Harper, Elizabeth Bassett and MPNforum.com with appropriate and specific direction to the original content.